THE small parish of Two Mile House has caught All-Ireland final fever as the Kildare junior champions get ready to make the trip of a lifetime. 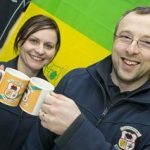 They will travel to Croke Park this Sunday to take on Fuerty of Roscommon in the All-Ireland Junior Club final and preparations are well under way for the big day. Sunday maas in the parish has been brought forward an hour so that the squad, management and supporters can attend before heading up the M50. If ever there was a time for prayers and well-intentioned requests for favours from a higher deity then this is surely it although it seems that no amount of prayer will repair Peter Kelly’s knee in time for the talisman to take his place on the pitch. Manager Jarlath Gilroy has almost a full strength squad to choose from apart from Kelly, although Christy Burke is also likely to miss the big day, and having clinched a dramatic semi-final win over Monaghan side Emyvale hopes are high that Two Mile House could become the first Kildare men’s team to lift an All-Ireland title. Midfielder Derren Casey says the playing squad will have to keep themselves away from the hype as much as possible in the build to the game.